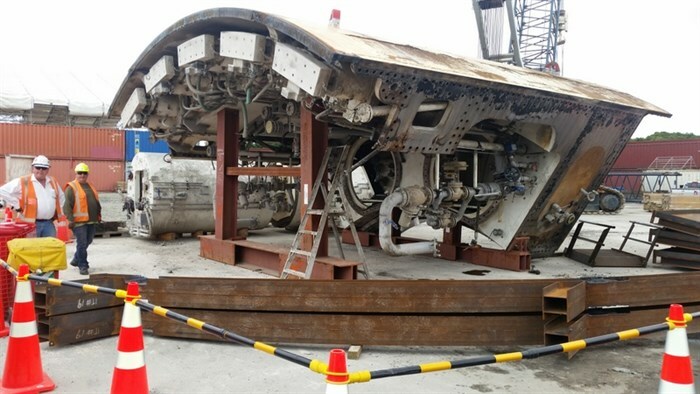 This is a story about Alice, the Waterview Tunnel boring machine. I’m upstairs in my office quickly reading my neighbour’s NZ Herald before he arrives at his work. “There is 5 kilometres of steel conveyor to be water or chemically cleaned. We have a site organised at Harris Road in East Tamaki. Three days later we had completed inductions and had the plant and equipment sorted, ready to start this massive cleaning job. These conveyors were used to take the spoil from the cutting head to the end of the tunnels for removal to a Wiri site where it was used to fill in a large quarry. Some of the conveyor steelwork needed degreasing and hot water to get a good result. The purpose of the clean was to meet the MPI requirements so that the plant could be exported back to Germany and other parts of the world. We have a great staff with top qualifications, which enabled us to put a team together very quickly to handle this work. Our plant and equipment is kept in top condition, so it only required a quick check over and service and we were in business. Phase I of the work was completed without problems and we met all the demands and challenges that this massive job presented. Some 12 weeks after we started the conveyor cleaning, George invited me to the main site at Mt Roskill where Alice had surfaced having completed the two tunnels for the Western Motorway system. I just could not believe my eyes when I saw the size of this beast! We need three qualified cleaning teams, fully trained to NZQA standards. We need three pressure cleaning machines at 5000 PSI plus turbo heads for extra grunt. We need pressure hot water machines to be available to assist with grease removal. We need teams to be available 6 days a week working 12 hour shifts. Five days later it was all go. We had three great teams ready and waiting to give their best performance in this demanding environment. 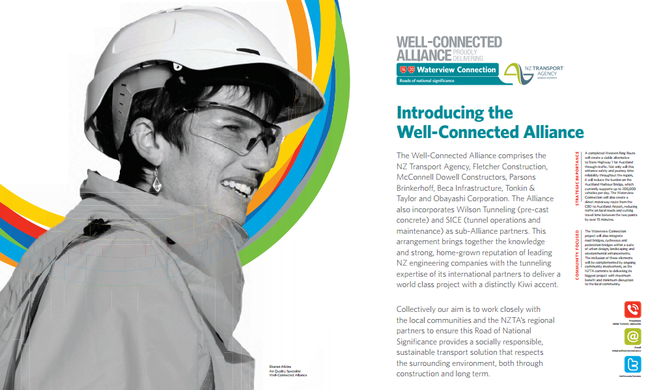 We worked closely with the main contractor- Well Connected Alliance. These guys were wonderful to work with – safety always paramount and great communication. 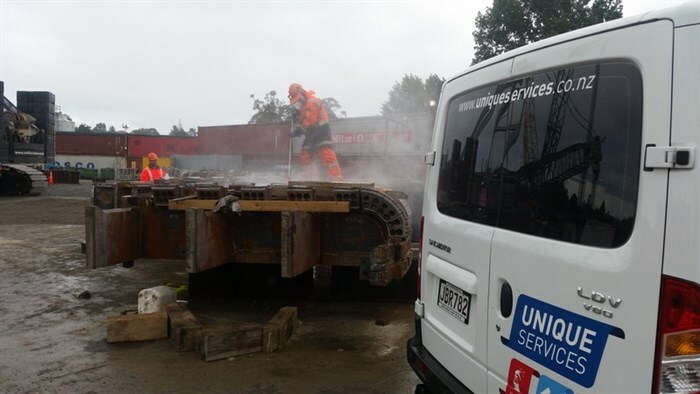 Unique Services is a highly qualified PCNZ contracting company giving us the opportunity to be a preferred contractor for Fonterra, Goodman Fielder, Griffins Foods, Nestle and many national and multinational companies. Three months later it was all over – done and dusted. “As the cleaning of Alice is coming to a close, I want to thank you and your team for the great work over the last few months. This has been a demanding contract, starting with the cleaning of 5 kilometres of conveyor steelwork at a site at East Tamaki. This involved numerous days of dealing with up to 3 truck and trailer loads of steelwork in difficult conditions and to a tight timeframe. At our Waterview site, your team had to again work in demanding conditions to ensure the safety of all personnel and to produce a quality job. 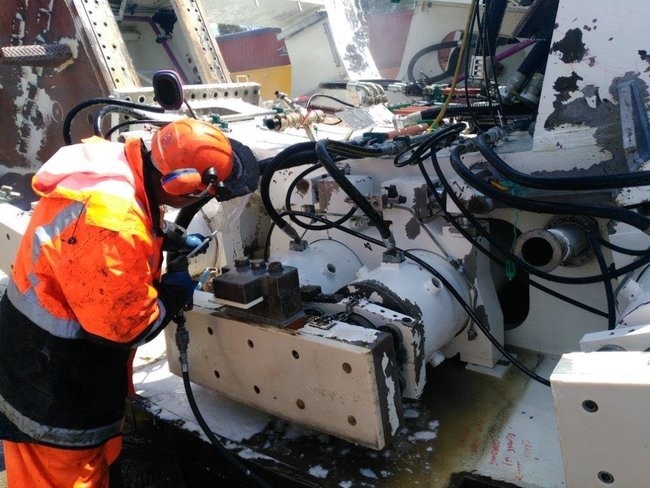 Using the correct chemicals, super-heated water and very high pressure cleaning gear, the tunnel drilling machine and its components were cleaned to a high standard to allow export of the equipment back to the supplier. I must also comment you on the high standards of staff training and Health and Safety. This is the key focus area on our site and your team has been exemplary. In addition they have been friendly, obliging and totally reliable. 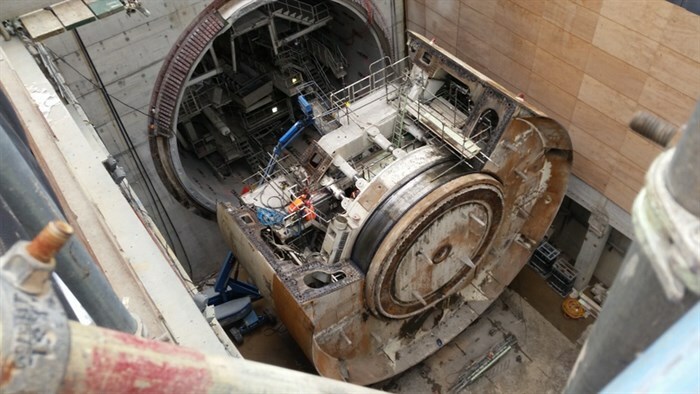 In October 2015 the EPB Shield (earth pressure balance shield) tunnelling machine manufactured by Herrenknecht of Germany and affectionately called Alice, finished the second of two tunnels for the Waterview Connection. As part of the contract the huge machine had to be disassembled, all the component pieces completely cleaned then loaded into twenty 40’ containers and sent back to Germany, or some-where else in the world in her current guise, or modified for a different type of operation. The cleaning component of this operation was carried out by Unique Services and was started in October 2015 and completed at the end of March 2016. To gain an understanding of the complexity of this job, consider the following facts about Alice. To further complicate the cleaning process, Alice not only bored the tunnel, but simultaneously installed 24,040 2 metre concrete lining panels at the same time as removing 800,000 mᵌ of soil. 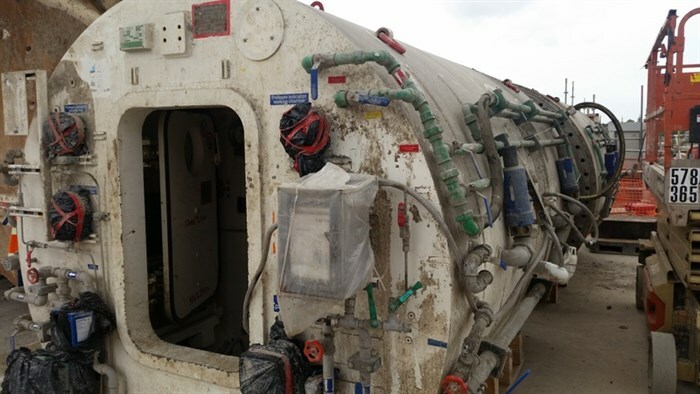 All of this combined with the complexity of the component pieces contributed to an extremely complicated job for Unique Services, including removal of dried cement, grease and general dirt build up in extremely confined spaces and other areas with difficult access. The nature of the cement build up and mixture of grease and dirt required the use of 5,000psi water blasters, and with turbo heads this pressure was greatly enhanced. We also had to modify other pieces of equipment and improvise cleaning techniques on the go, in order to meet the level of cleanliness demanded by the client. When the job started in October, a lot of the smaller components from Alice were delivered to a yard in East Tamak,i where they were cleaned by water blasting and chemical treatment before being loaded into containers. The majority of the work was carried at the Owairaka HQ of Well Connected Alliance, the contractor on this project. Unique had three teams working on this site from the start of the job until the finish in March 2016. As you can imagine, all the team members needed to undertake strict site inductions and were required to use full PPE including boot covers, full face shields and respirators when required. Once again, an extremely challenging job completed on time by Unique’s experienced highly qualified teams. What’s our secret to performing under pressure? It’s not magic- we are simply highly organised with wonderful staff. We own our office and depot facilities which were purpose built to suit our needs. 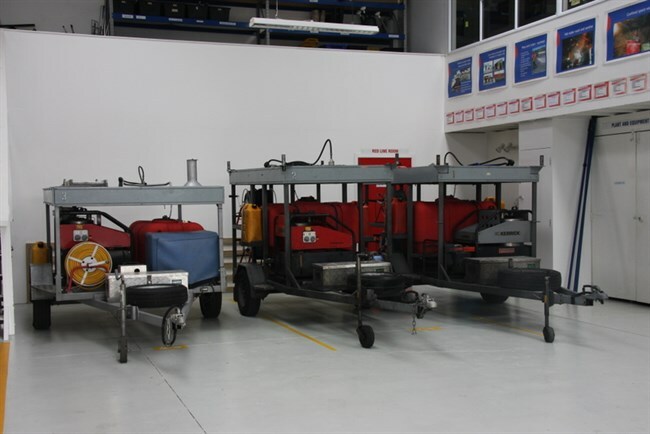 Our plant and equipment is the best in the business – much of it purpose built. Health and Safety is paramount, as is ongoing training for our entire team. This is a family business where everyone will go the extra mile to achieve what is required. What contracting services do we offer our clients? We assist food manufacturing and distribution companies to keep their premises clean and meet their hygiene audits. We are proud that all our audit cleaning has passed inspection for our clients. Anti-microbial treatments: we lessen the chances of bacteria outbreak in the food manufacturing and production sector. Commercial and industrial painting: interiors, exteriors, roofs, rust treatments, waterproofing, floor coatings, you name it. Bird proofing: large canopies, spikes and advice on the most cost effective method. Grounds care: covering all external needs, lawns, gardens, design, site clean-ups. Floor maintenance: we can transform your floors, cleaning, floor grinding, and epoxy paint systems. We specialise in programmed and planned maintenance. Our clients have the option of cost effective monthly payments, or payment on completion of work. We are a one-stop shop and can plan our work in advance which enables us to make good savings that we can pass on. Do you have a challenge that we may be able to help solve? Unique Services has just been nominated for the Westpac Business Excellence Awards. This is a real honour to be nominated and is an endorsement of how we run the business and care for both our staff and our clients. 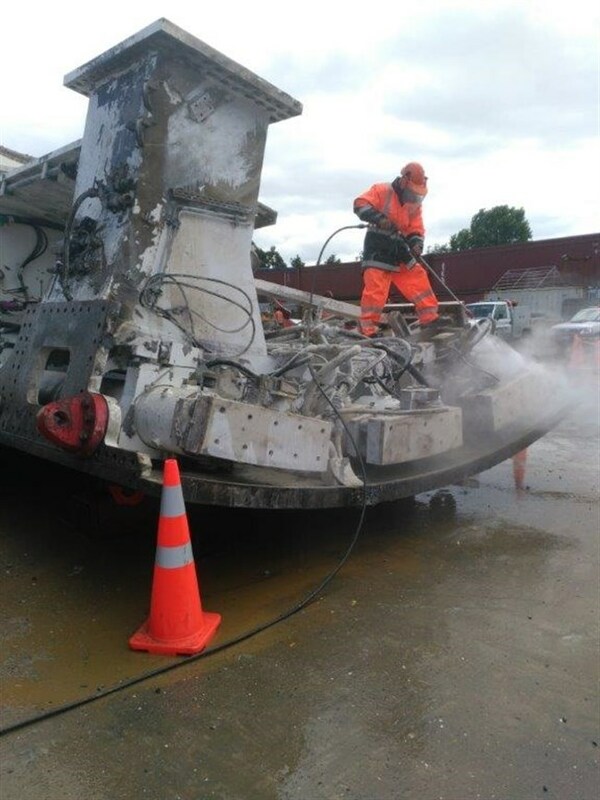 After two years of rumbling under Auckland to create part of the Waterview Connection, the 87m piece of German machinery was dismantled, packed up and sent back home last month. Here is a video documenting the final leg of Alice, the giant tunnel boring machine’s New Zealand journey.